Anti-ageing benefits 🌸🌸🌸🌸 Glow, hydrate, plump & smooth skin, reduce fine lines & wrinkles, fade age spots and pigmentation, reduce scars and stretch marks. Effort 😎 Easy – takes max. 10 mins just 1 or 2 times a week. Feel the difference within days, but best results after 1 to 2 months. For regular, ongoing use. Very easy to use, requires gel. Quick, pleasant, pamper time. Relaxing. No pain or side effects. Mira-skin support is prompt and helpful. You get a 2-year warranty, but no money-back guarantee. Some reassuring blogger feedback but little from online reviews. 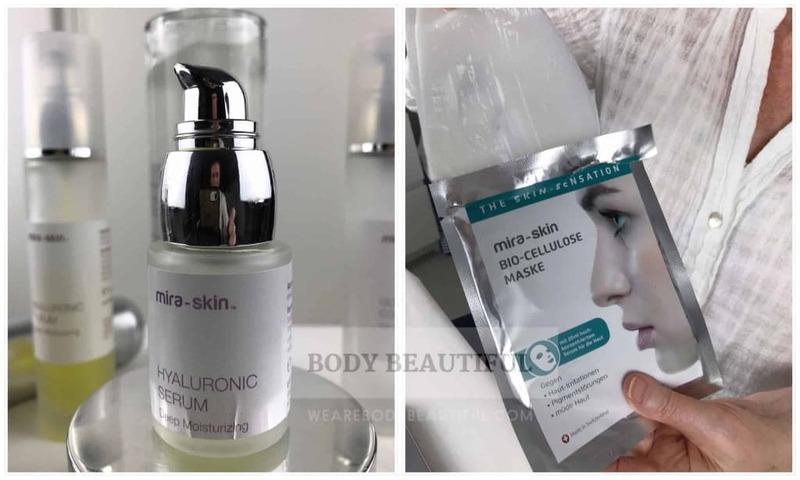 Budget range: £££ +serum +gel More affordable than other options (RRP £289 / $349, regular offers), ongoing cost for Mira-skin conductive gel and Hyaluronic Serum. Learn more in the review. The Mira-skin is an anti-aging system for face, neck and décolletage. 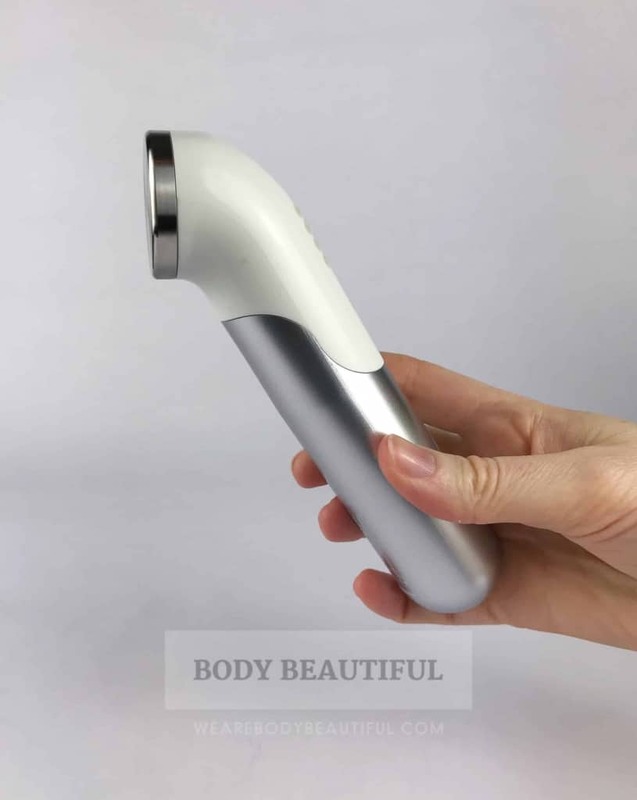 It’s a small hand-held ultrasound device and conductive gel, which works in partnership with anti-aging skincare. The starter kit comes with the cordless ultrasound device, conductive gel and trial size Hyaluron serum. 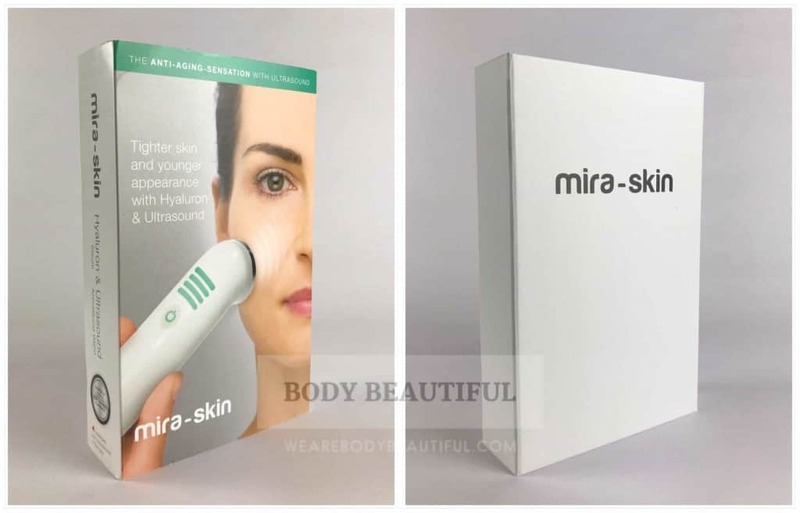 The Mira-skin is an easy to use, clinically proven home-use ultrasound anti-aging device. Use it with the Mira-skin and / or your favourite anti-aging serum. The starter kit (pictured) is very good value (RRP £289 / $349). Swiss company Techmira AG manufacture the Mira-Skin system in Germany. Modelled on popular therapeutic ultrasound, the technology is real-world tested at Anni Valentin’s professional aesthetic clinic in Freiburg im Breisgau, Germany. The excellent results inspired her design of this smaller, same-power but safe for home-use Mira-skin system. It’s also used in beauty spas. Available in the UK since 2015, it’s kept a low profile but has a strong fan-base in Germany and Switzerland. It’s clinically proven and safe for all skin tones and types, even the most sensitive. Use the serum daily, and with the ultrasound once or twice a week. It’s for regular, ongoing use. Some feel the effects immediately, but results build so they’re noticeable at between 30 to 60 days. This is an in-depth review. The first half covers what the Mira-skin does and how it does it. This is for you if you want to understand the science behind the claims. The second half is about what it’s like to use, if it’s good value, user feedback and the pros and cons. Keep reading to learn if it’s the best anti-aging device for you. Part 2: What’s it like to use? Is the customer support good? Is the Mira-skin serum a good choice? Is the Mira-skin gel a good choice? Weekly use of the Mira-skin ultrasound boosts the effects of your skincare. It does this by getting more product deeper into your skin. Apply an anti-aging serum before, and your favourite skincare products after, the ultrasound session. It gives superior results than serums and creams alone. The ultrasound also stimulates collagen and elastin production to make your skin fresher and glow. 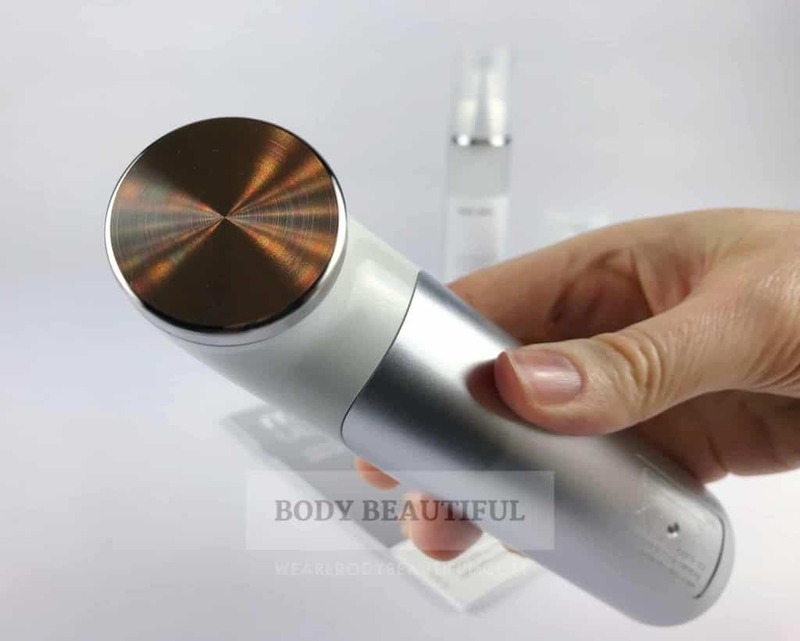 You can use your own favourite anti-aging serum with the ultrasound. However, it partners perfectly with a special, daily-use Hyaluronic Acid serum also from Mira-skin. The result from the combination is compelling. And if you’re a skin care junkie, it’s irresistible. You’ll want to try it. It’s a very attractive choice, especially if you love and already invest in effective skincare products. Let’s get into the nitty gritty. 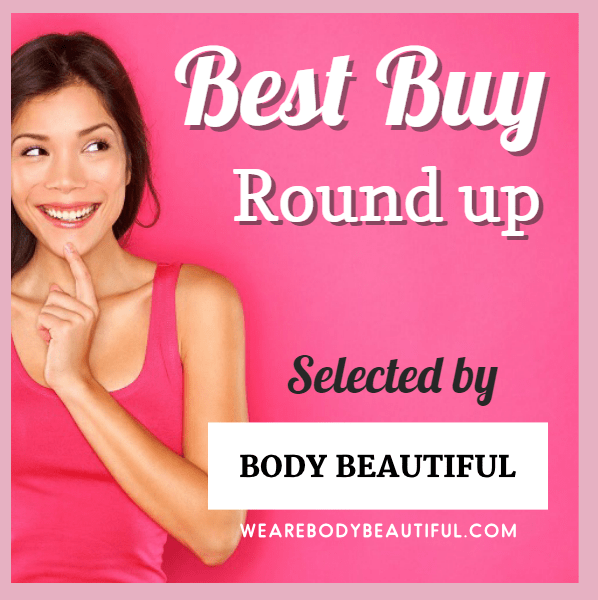 We’ll start with how skincare boosting helps, and how the ultrasound wand does it. How does boosting skincare help? To answer this, we need to understand what’s in anti-aging skincare and how it works with your skin. In your anti-aging skincare are several ingredients. Some give the colour, fragrance, texture, feel and keep them fresh. But others, known as active ingredients, spark specific activity in your skin for lasting anti-aging effects. They help nourish, protect, repair and stimulate your skin. For active ingredients to be effective they must get into your skin. And the first challenge is to pass the protective outer layer. Your skin does an exceptional job of protecting the lower layers. 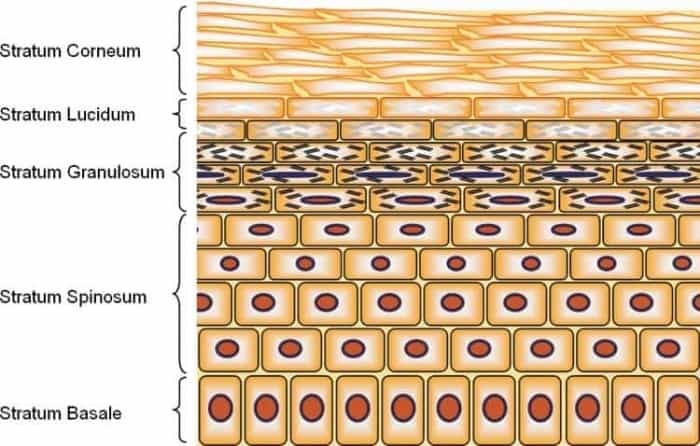 The outer most layer is the stratum corneum. It’s typically only 10–20 μm (micrometres) thick. 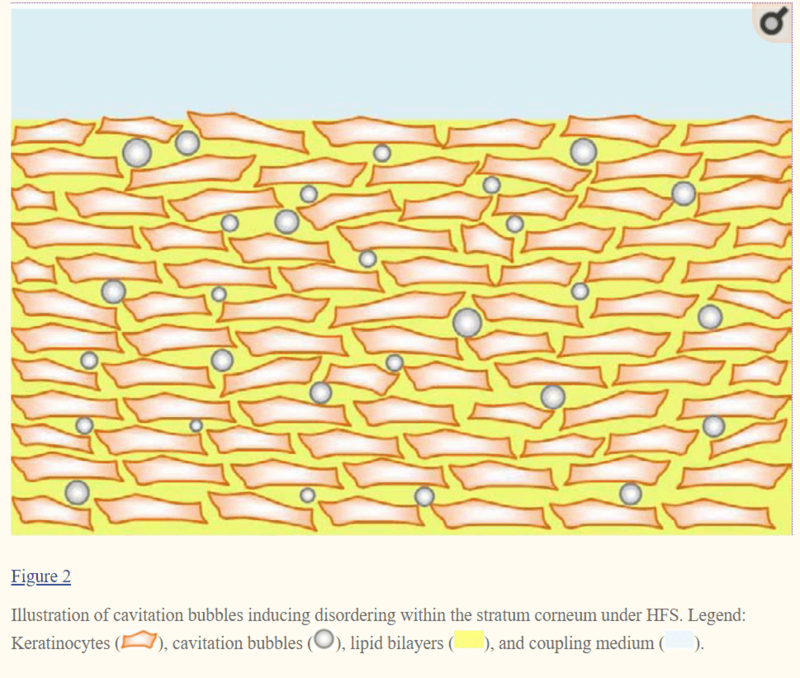 But the cells (called keratinocytes), are tightly-packed, bonded together and surrounded by a stacked lipid bilayer. These water-insoluble lipids glue the keratinocytes together forming a highly impermeable ‘brick wall’ pattern. This keeps water in and all harmful things out. No surprise then, many skincare molecules have trouble passing this protective layer. It slows or stops some entirely. Smaller molecules can sink to the lower layers. But others are too big so they stay on the surface. Skincare brands spend big money developing formulations that get deeper into your skin because they’re more effective. With regular use results are slow and subtle. And because they’re gradual it’s often hard to detect change. Therefore, the cost of premium formulations sometimes doesn’t seem worth it. But, if you could get more concentrated ingredients deeper in your skin, you’d notice the difference. And this is what the Mira-Skin ultrasound does. I love it promises to get even more from the skincare you’ve already invested in. How does the Mira-skin ultrasound boost work? Ultrasound is a sound pressure wave. It oscillates back and forth like a vibration. The human ear can hear sound with a frequency between 15,000 and 20,000 cycles per second. Ultrasound frequency is higher than this so we can’t hear it. We measure sound wave frequency in Hertz (Hz). The Mira-skin uses high frequency ‘soft’ ultrasonic waves at 1 MHz (1 million oscillations per second). Physiotherapy commonly uses 1 MHz to 3 MHz. 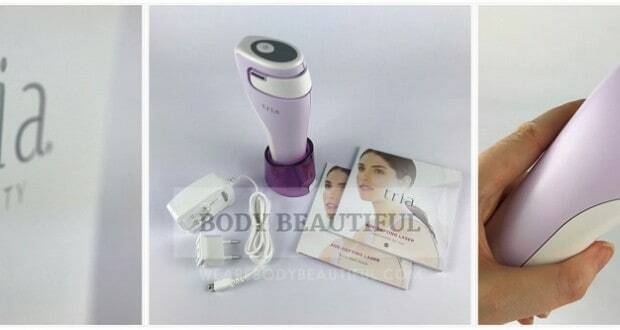 The Mira-skin ultrasound wand uses high frequency ‘soft’ ultrasonic waves at 1 MHz (1 million oscillations per second). It’s painless and gentle on your skin. This is the same frequency as commonly practised in physiotherapy for a procedure called phonophoresis (also know as Sonophoresis). Phonophoresis helps your skin better absorb molecules from creams and gels applied to the surface. First studied in the 1950s, it’s an established, safe procedure in physiotherapy. It typically uses ultrasound frequencies of 1 MHz to 3 MHz. The ultrasonic vibrations temporarily disrupt the protective outer layer of your skin. This creates bigger gaps so larger and more molecules can pass through. In physiotherapy it sends helpful medicine molecules such as pain killers and anti-inflammatory drugs to the source of pain. The Mira-skin uses phonophoresis to send skincare active molecules deep into your skin where they work harder. But how exactly does phonophoresis do it? The skin barrier disruption occurs because of acoustic cavitation. It’s thought the ultrasound vibrations form tiny bubbles in between the keratinocyte cells. These then vibrate to jumble it all up and create tiny openings. 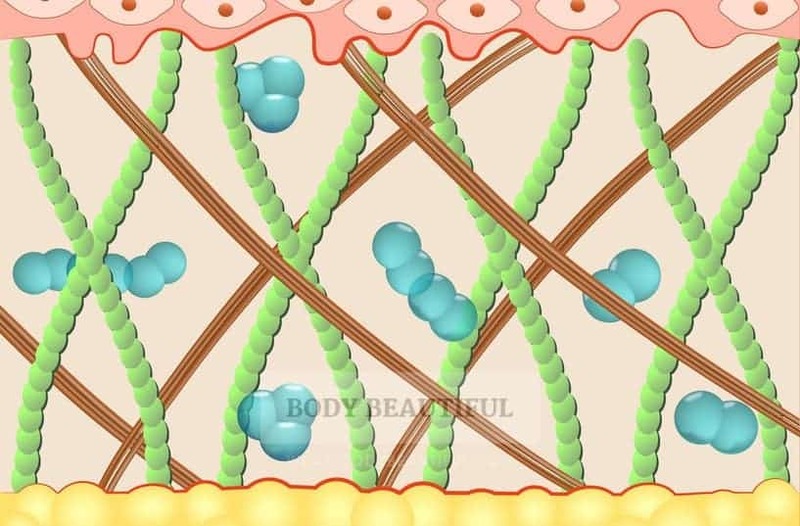 Skincare molecules then have easier passage through the stratum corneum to the lower skin layers. Phonophoresis: Ultrasound creates tiny bubbles in the lipids which vibrate and jiggle things up to make tiny temporary openings. Skincare molecules can then pass easily through them. This is how the Mira-skin ultrasound works. The effects are temporary, but the pathways stay open for a while. With the Mira-skin it’s around 30 minutes. 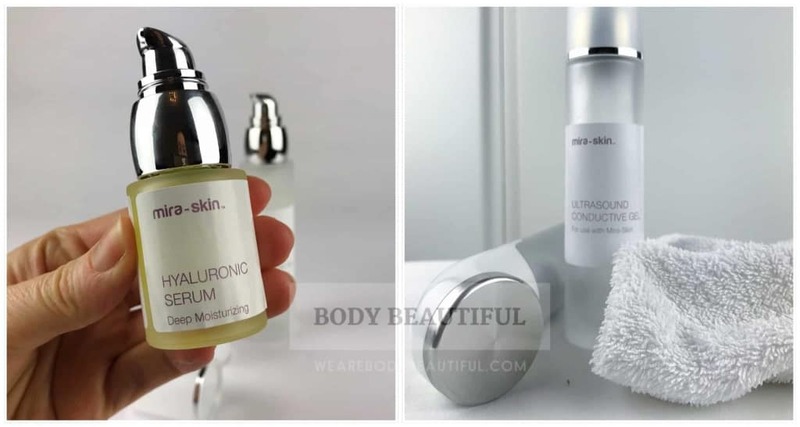 So, you can apply skincare serum before and immediately after the ultrasound treatment. It gets more and much deeper into your skin. You can buy other ultrasound phonophoresis devices. But there’s more about Mira-skin that makes it special. Learn about this next. 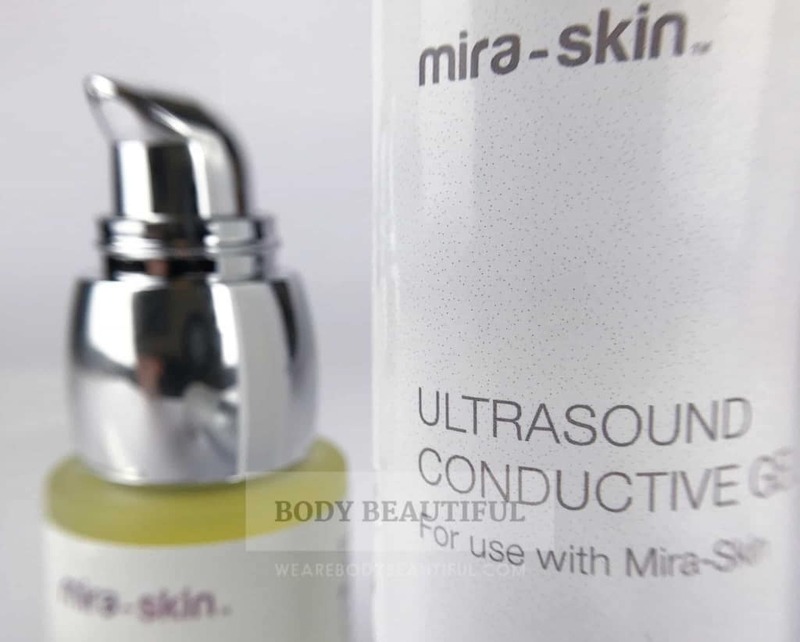 Mira-skin say other ultrasound devices aren’t as powerful. This means you must use them much more frequently to get results. Treatment guidance ranges from 4 times a week to up to daily use. Mira-skin explain they use more expensive quality components. This packs the same power as salon devices into the small ActiveBoost wand. You need only one 10-minute session a week to see boosted results from your skincare products. N.B You can do more for faster results, but don’t exceed 3 sessions a week. The ultrasound is powerful and overuse can tire out your muscles and skin tissues for the opposite effect! But that’s not the only thing that sets it apart. The key difference is a specially formulated anti-aging serum to use daily and partner with a weekly ultrasound boost. 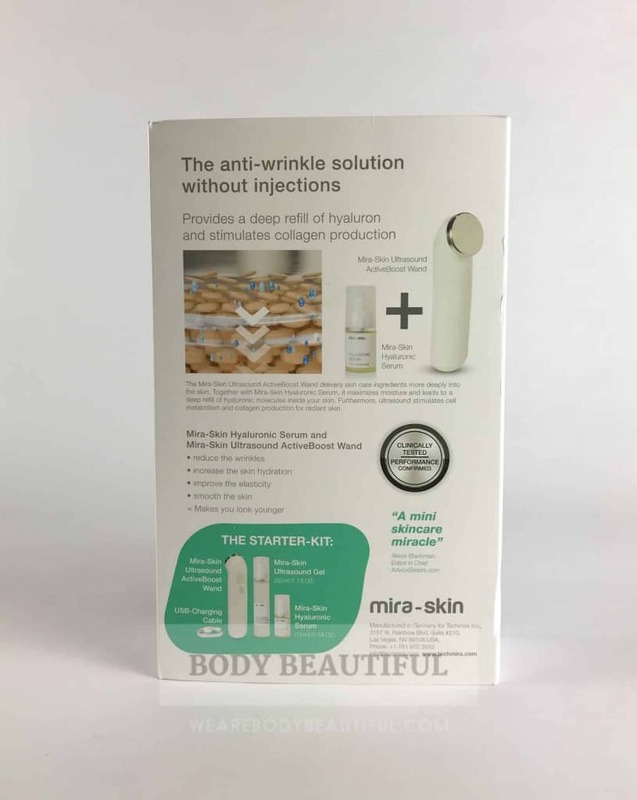 You get 15ml of the Mira-skin serum to try in the starter kit. So, why are they such a powerful duo? 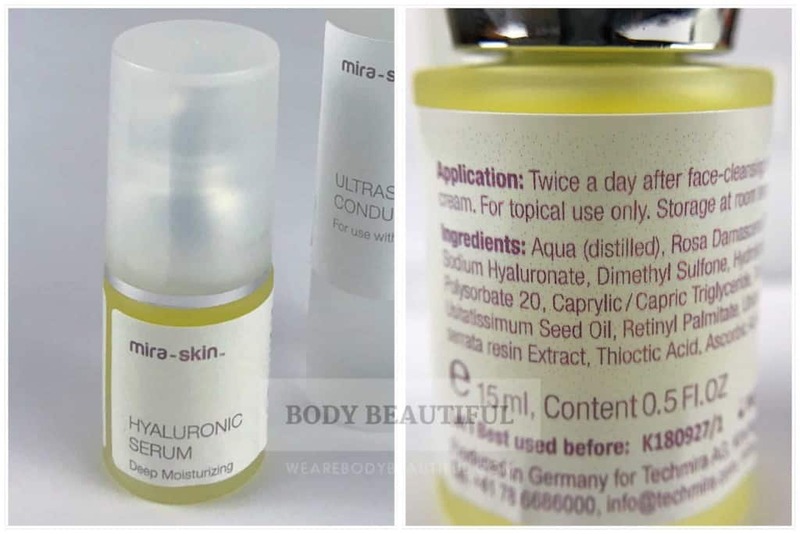 What’s in the Mira-skin Hyaluronic serum? 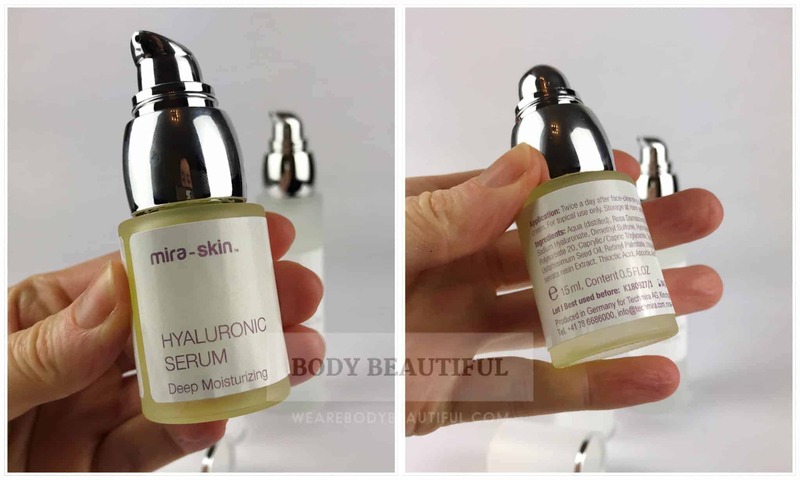 The small, tester bottle of Mira-skin Hyaluron serum you get in the starter kit. 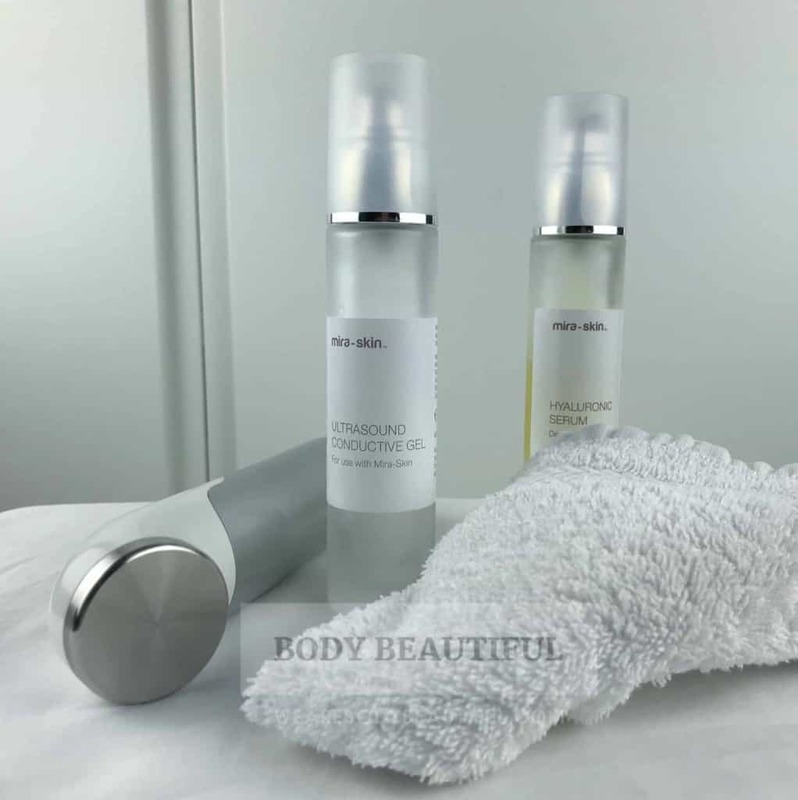 Mira-skin provide an explanation of the key ingredients. However, I checked with an objective source at incidecoder.com. It’s an excellent (rather addictive) website to decipher what’s actually in your skincare products. Several of the serum ingredients moisturise and make our skin feel nice and soft, and others are there to mix the product together and make it feel good. There’s a good mix of anti-aging actives in this single multi-concern serum. The actives help with reducing wrinkles, skin brightening (dark spots and redness), protecting collagen, smoothing and firming skin. This sounds good to me and I like. But the key ingredient here is Hyaluronic Acid. Next, we’ll learn why it’s so special, and why Mira-skin partner it with the ultrasound boost. Hyaluronic Acid occurs naturally in our bodies, in our joints, ligaments, skin and eyes. Despite the word ‘acid’, it’s actually a sugar. And a clear gel-like goo and a water-loving super-sponge! Various internet sources say it can hold up to 1000 times its weight in water. No surprise then our bodies use it to hydrate tissues and lubricate joints. 50% of yours is in your skin. It’s found throughout your skin in the dermis (lower) and epidermis (outer) layers. Along with collagen and elastin (more on those later), it’s the main molecule in your skin’s extracellular matrix (ECM). This is the scaffold that supports and nurtures your skin cells and keeps it looking young. The water Hyaluronic Acid holds keeps skin firm, smooth and plump. It’s the reason babies and children have such perfect, soft skin. ollagen (brown), Elastin (green) and Hyaluronic Acid (blue), in skin’s extracellular matrix (ECM). The ECM molecules fill the gaps between your skin cells and are vital in maintaining structure and health. Hyaluronic Acid is the main molecule here. Unfortunately, from early adulthood your Hyaluronic Acid starts a steady decline. This contributes to the first signs of aging in your 30s and 40s. Eventually, it disappears from your epidermis entirely. Yikes. Skin becomes dry, dull, sagging and wrinkled. Boo. 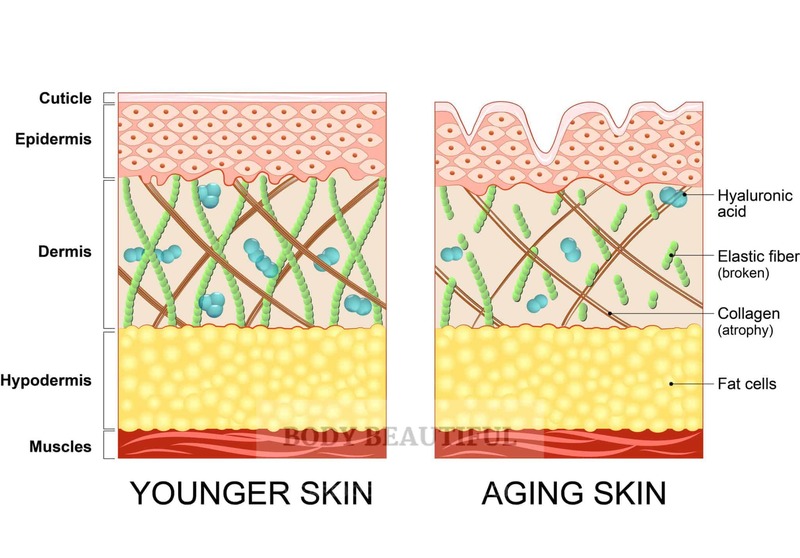 Left: Younger skin is organised, strong with activated cells and fibres, and plenty of Hyaluronic acid in the epidermis. The skin surface is smooth. Right: Cells and fibres in aging skin are fewer, weaker, broken and slow. Hyaluronic Acid eventually disappears from the epidermis entirely. The skin surface is wrinkled and thin. So, replacing what’s lost as we age is a neat idea. And skincare can help. Hyaluronic Acid is an ‘IT’ ingredient in skincare right now. What does it do? How does Hyaluronic Acid work in skincare? Hyaluronic Acid is a repeating molecular structure (called a polymer). The subunits can repeat many times as long-chain (or high-molecular-weight), or just a few times as short-chain (or low-molecular-weight). In its high-weight, long-chain format it’s too big to absorb into your skin. Therefore, it sits on the surface drawing moisture from the air to hydrate and smooth the outer skin layers. It’s an excellent moisturiser. In the world of skincare ingredients, it’s a humectant. You can formulate Hyaluronic Acid to be shorter chain. And clinical research shows medium and short-chain molecules sink deeper into the skin. The shorter the chain the deeper they go. They then attract and hold onto more water in the skin. And soap and other cleansers can’t wash them away. Therefore, with daily application it builds in your skin. But it takes time. The Hyaluronic Acid molecules stay inside your skin for about a day. Then enzymes break them down. So, it’s a slow-refill process as the molecules steadily increase. This gradually plumps the skin making it firm and bouncy. And over time it subtly fills out fine lines and reduces wrinkles. So, a good hyaluronic serum needs molecules of different chain lengths. The Mira-skin Hyaluronic serum: short, medium and long chain molecules reach different depths in your skin. It’s packed with other anti-aging goodies such as Vitamins E and A. Results are even better with the ultrasound wand. It’s clinically proven. And this is what the Mira-skin Hyaluron serum has. It’s made of Sodium Hyaluronate with a mix of long, medium and short chain molecules in it to absorb to different depths in your skin. Mira-skin have good clinical data showing the effects of daily application of the serum alone. 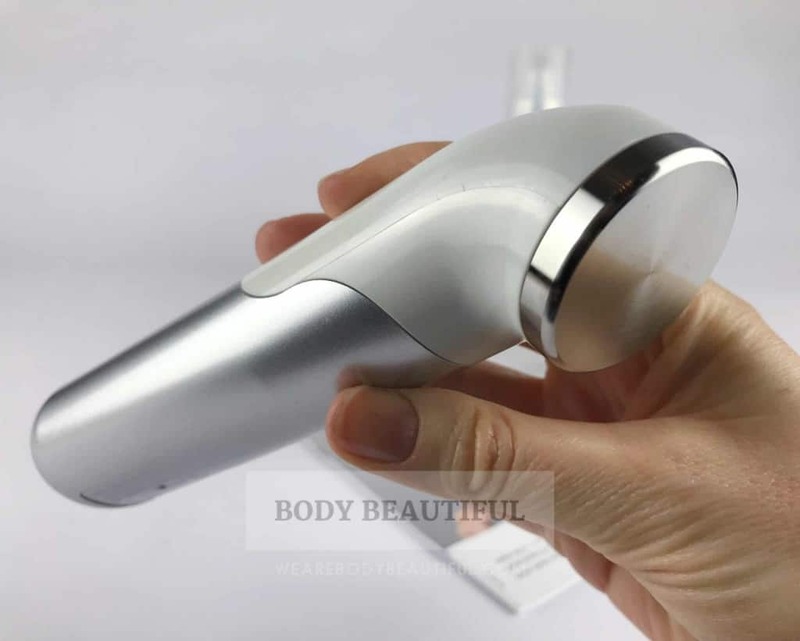 But the clever bit is it’s engineered and tested to partner with the ultrasound boost for even better skin-plumping results. Mira-skin say use the serum daily, morning and night. Then, at least once a week, combine the Mira-skin serum and ultrasound in a quick 10-minute treatment. An irresistible and impressive combination: The combination quickly replenishes the plumping Hyaluronic Acid lost as you age. Each weekly ultrasound boost is a super-quenching energy drink. It deep-fills Hyaluronic Acid in your skin. So, along with daily application of the serum, the Hyaluronic Acid builds much deeper and faster. With even more plumping water. Therefore, your skin gets noticeably plumper and smoother. Fine lines and wrinkles reduce over 1 to 2 months of use. 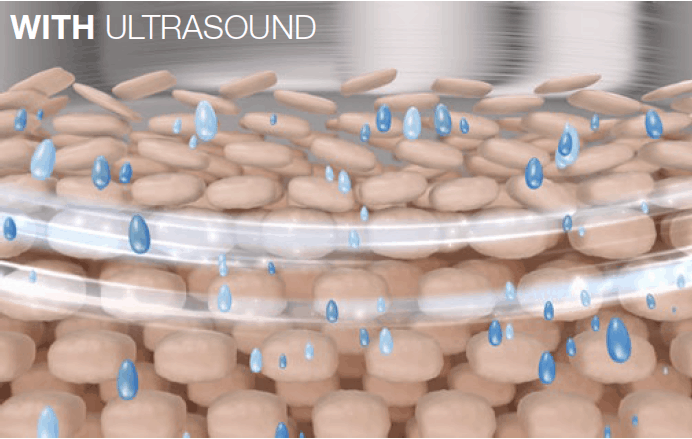 Ultrasound boost illustration from the Mira-skin user guide. And don’t forget, the ultrasound boosts other anti-aging goodies from the serum and your skincare. They reach more of your skin for a magnified effect. You’ll feel and see the difference there too. The clinical test data (discussed later) includes the Mira-skin serum. It’s impressive, and based on this alone, the serum sounds like a great addition to your skincare routine. But read the rest of the review to learn more. Next, learn about the ultrasound stimulation of collagen and elastin. Most other home anti-aging devices focus on increasing collagen and elastin. That’s because they refresh and rejuvenate your skin. The Mira-skin ultrasound does this too. Collagen and elastin are the mesh of fibres supporting your skin. Along with Hyaluronic Acid, they’re mainly found in the deeper dermis skin layer. Fibroblast cells produce both collagen and elastin. And from around 30, you produce less and less collagen and elastin each year. And what’s left is sluggish and weak too. This is known as ‘atrophy’. The result is dull skin, rosy-redness and darker spots, wrinkles and fine lines. Kickstarting our cells to produce stronger and reinvigorated collagen and elastin is therefore a good thing. And this is what the Mira-skin ultrasound starts. I can’t find clinical studies about ultrasound skin rejuvenation. But there are several therapeutic ultrasound healing studies. These explain the effect on our skin cells. Physical therapy commonly uses ultrasound to treat pain, and heal muscles joints and tissue injuries. Although open to some discussion, it’s thought the ultrasound gently heats tissue. This doesn’t hurt or damage the skin. But it does increase blood circulation to the cells. Blood removes waste from your cells. Therefore, increased blood flow detoxes them. It also delivers more oxygen and nutrients. The cell power generators, called mitochondria, use these to create more Adenosine Triphosphate (ATP). ATP powers cell metabolism, so with more fuel they get faster. The result: your sluggish skin cells ‘wake-up’ and start working harder. Each ultrasound session energises them. They create new cells and produce stronger collagen and elastin fibres. Gradually, it refreshes your skin making it brighter and more radiant. Your energised skin cells also work with the deeply-diffused nutrients from the serum and your own skincare products. It all combines. Regular weekly treatments gradually repair and revitalise the layers of your skin. Phew. So, if you’re still here, you’ve now got the full explanation of what the Mira-skin does! Here’s a quick summary. This hydrates, plumps & smooths, brightens tone, and reduces pigmentation, scars, fine lines and wrinkles. So, how quick will you see results? This guidance is for daily application of the Mira-skin serum with one or two weekly ultrasound sessions. You’ll likely feel some quick effects from the mega-hydrating Hyaluronic Acid, such as relief from dryness, softer and smoother skin. Then, over the next month or two the Hyaluronic Acid builds, replacing what you’ve lost. Your skin gets plumper and fine lines and wrinkles reduce. You’ll also see changes from your skin’s increased collagen and elastin. And from the other serum actives too. As your complexion gradually refreshes, age and dark spots start to fade, your tone brightens and scars fade. Thus, hydrated, plump, bright, supple and smooth skin with reduced wrinkles. What if I use my own serum? Using an anti-aging serum with ingredients focusing on your areas of concern is vital. But you don’t have to use the Mira-skin serum. The ultrasound boosts the effects of all good anti-aging skin care. 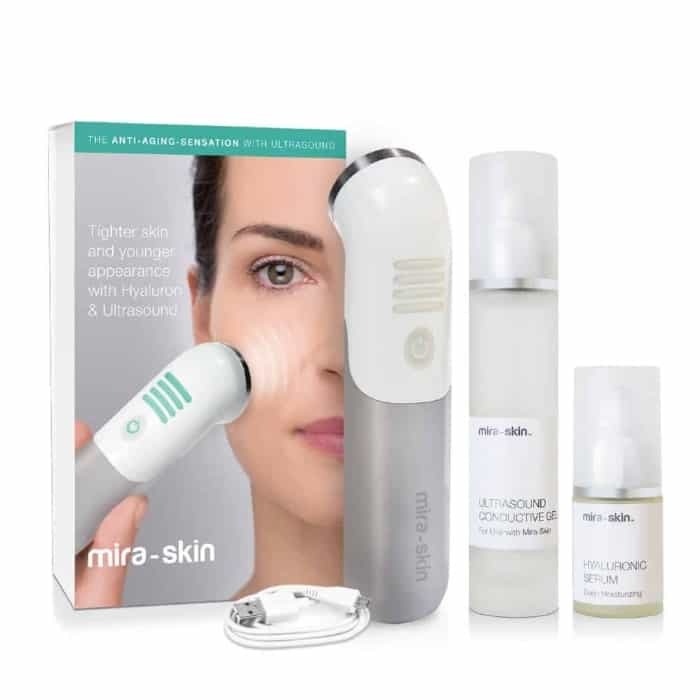 Mira-skin say you can use your own anti-aging serum with the Mira-skin ultrasound. For best plumping results it needs at least 2% Hyaluronic Acid. Plus, other anti-aging actives to target your specific concerns. Try and compare yours with the 15ml Mira-skin serum sample. However, if you use your own serum you may get different results. Because it’s down to the active ingredients they contain. For example, the Mira-skin serum works to reduce pigmentation and age spots. So, check your serum addresses all your concerns first. If you want plumping, wrinkle-filling results you’ll need varied chain-length Hyaluronic Acid too. 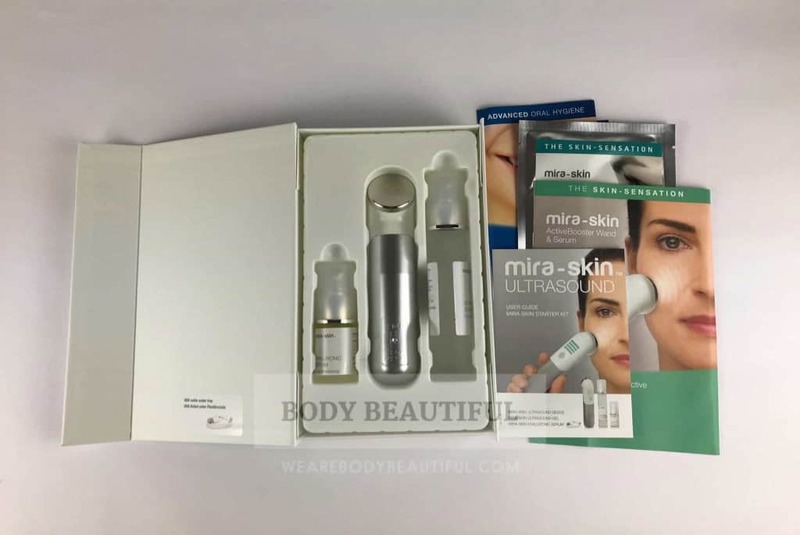 I think the Mira-skin (ultrasound & serum) are a compelling and unique choice because together they’ve clinically proven results for replenishing Hyaluronic Acid levels in your skin. No other device does this. Let’s look at the proof now. Mira-skin commissioned a clinical trial in 2016. The trial had 40 subjects and lasted 4 weeks. The assessors used facial 3D imaging software. At the trial start they recorded skin wrinkle depth and facial texture for each subject. They then recorded and compared at the end of the 4-week trial. The study focused on anti-wrinkle effects of the Mira-skin. So, the results shared are the average % decrease in wrinkles and increase in skin hydration, elasticity and smoothness. The results from the 2016 Mira-skin study. The results for Mira-skin ultrasound & serum combined are impressive at approximately 30% improvement overall. The trial has a good number of subjects and a thorough, accurate way of measuring results. I like it a lot. It’s transparent. Other brands don’t always share such specific results. Therefore, it’s hard to understand how dramatic results will really be. But this gives a specific idea by how much it works. 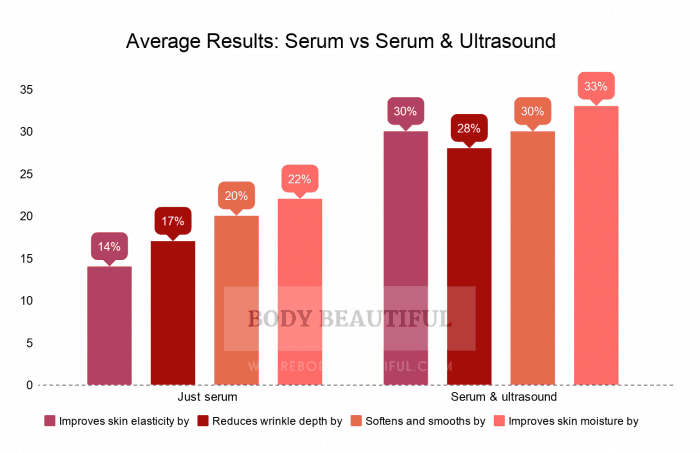 There’s approximately a 30% improvement on average using the serum and ultrasound. Mira-skin are obviously confident in their product. I’m feeling it too. However, the study doesn’t address the other advertised effects. Namely fading age spots & freckles, dark pigmentation reduction and minimising scars and stretch marks. Mira-skin advise that since the 2016 study, they’ve seen excellent results on age spots, pigmentation and scarring. And they’ll shortly share data specifically on scarring, acne scarring and stretch marks. For pigmentation and skin tone concerns they stand by their claims. But they highlight it’s primarily down to the powerful ingredients in the serum and mask, then boosted by the ultrasound. So, try the full system for these benefits. Independent clinical verification always gets my vote, but I appreciate there are other ‘off label’ benefits of home beauty devices. I’m excited for the new supporting data Mira-skin shares soon. Now, lets’ move onto what it’s like to use the Mira-skin. The Mira-skin starter kit comes in a small neat white box with ‘mira-skin’ printed on the front. It’s covered by a green, grey and white slide off information sleeve. The Mira-skin box is small and sturdy measuring 16 x 24 x 5cm. Keep it to store the device in if you travel with it. The sleeve front is simple and uncluttered. It states ‘Tighter skin and younger appearance with Hyaluron and ultrasound”. On the back, it explains Mira-skin fights wrinkles using ultrasound to deep-fill your skin with Hyaluronic Acid molecules. Plus other anti-aging actives from your skin care. The ultrasound also stimulates cell metabolism and collagen production to give radiant skin. The information is concise and clear and attractively laid out. It’s professional, with a clinical and medical feel to it. The results of the 2016 clinical test are clear along with a reassuring ‘clinically tested’ badge. The starter kit contents are clear and there’s a compelling quote to grab your attention. It’s clear, straight-forward, and with a clinical feel. It looks very professional. The inner white box opens from the side with a magnetic clasp. It’s perfect to store everything in if travelling. On lifting the lid the first thing I see is a the Mira-skin mask sachet, user guide and some promotional leaflets for Mira-skin’s ultrasonic tooth cleaning tool. Underneath those, is a moulded- plastic tray holding the ultrasound wand, small glass jar of the Hyaluronic Serum and a larger jar of ultrasound conductive gel. Underneath, the ultrasound ActiveBoost wand, small glass jar of the Hyaluronic Serum and a larger jar of ultrasound conductive gel sit in a moulded- plastic tray holding. There’s also a USB charging cable under the plastic tray. The Mira-skin starter kit contents. I also got a Mira-skin Biocellulose mask (not pictured). 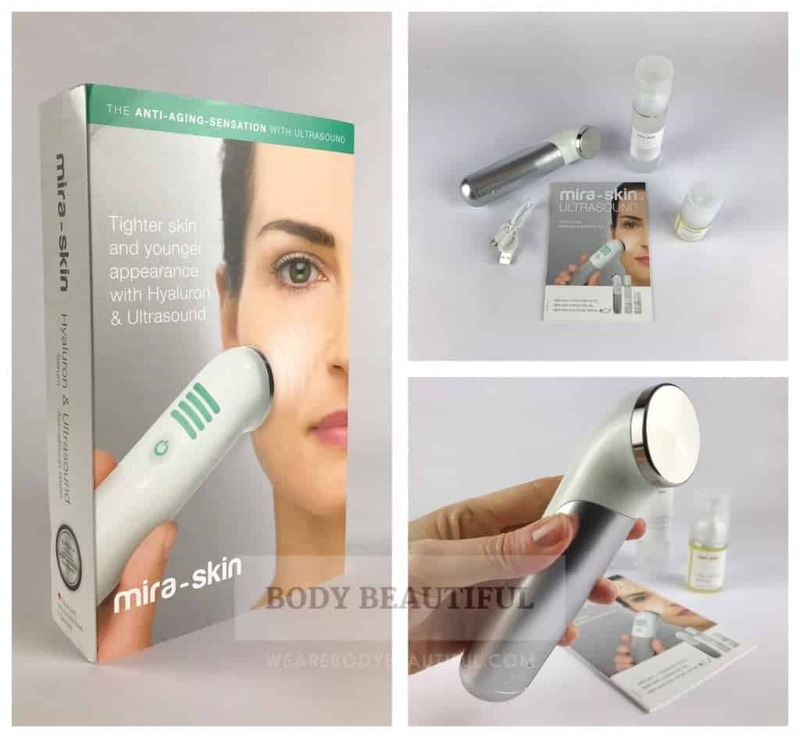 The Mira-skin ActiveBoost wand is small, lightweight and easy to hold. The ActiveBoost wand is 16 cm long and 4cm in diameter, and weighs just 155 grams. The bottom half is metallic silver embossed with a ‘mira-skin’ logo. The top is soft white. There’s a 3.5cm diameter circular treatment head made of surgical steel. It’s curved away from the straight wand, and angled back at around 45 degrees. On the back is a single power button, with four illuminating indicator lights above it. Each has a transparent silicone layer over them. The charging cable fits snug in the rounded metallic base. It rests safely on its side and the tip of the treatment head. The ActiveBoost wand is small and lightweight, but it feels solid, easy to grip and pleasing to hold. The treatment head is surgical grade stainless steel. The USB cable provided plugs into any USB mains adaptor, such as those from your mobile or laptop. I like that there’s no separate charging cradle or bulky charging cable and plug needed. I also like it comes with a full charge. You also get 15ml of Hyaluron serum and 50ml of ultrasound conductive gel in glass jars with silver pumps. Plus 1x facial treatment mask. There’s not much serum and I wonder how long it and the conductivity gel will last. Start by reading the user guide. The user guide is an informative, easy and quick read with helpful diagrams and pictures. The user guide is just 23 pages long. It’s logical and easy to follow. It starts by explaining ultrasound and notes you must use the conductive gel with the ultrasound wand. Then how it works with phonophoresis to diffuse vitamins and nutrients in your skin, and when to expect results. 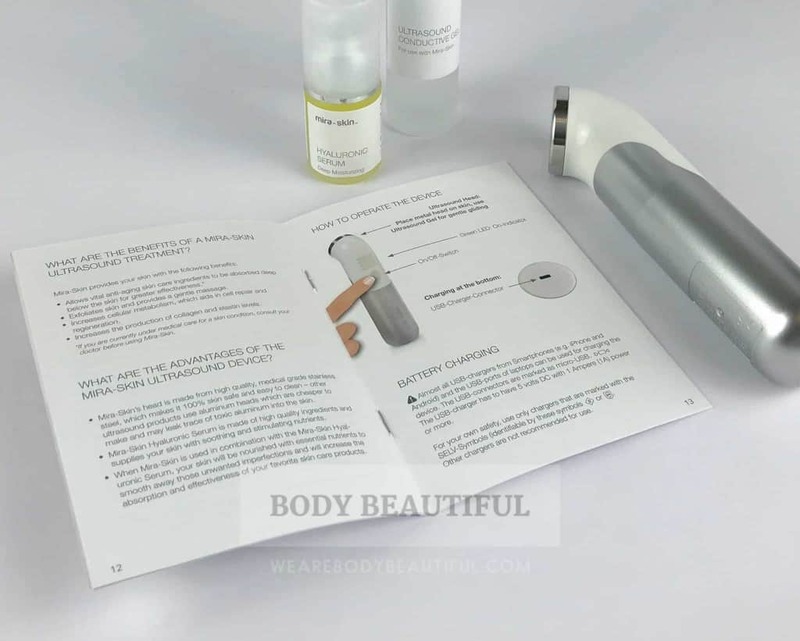 It explains the active ingredients in the Hyaluron serum, how to operate, the technique and areas to avoid with the ultrasound wand. Reassuringly, there’re no noted skin reactions to the ultrasound. Towards the back, the guide lists important reasons you shouldn’t use it, plus safety and warning information, as follows. The user guide sensibly stresses the following: consult your doctor before using the Mira-skin if you’re currently under medical care for a skin condition. It’s quick to get started because there’s no faff of a sensation test or test patch before using it. It’s simple to use and rather pleasurable! Learn more in the next sections. Each session takes 5 to 10 mins. Find a comfortable spot in front of a mirror with somewhere safe to sit the ActiveBoost wand and gel. Have a towel handy too. The ActiveBoost wand automatically shuts off if not used for 5 minutes. TIP: The gel can dry out quickly. Try applying it on one section of your face at a time, glide 3 times, then turn off the wand whilst you apply more gel to the next area. Repeat until you’ve done all your face and neck. There’s a handy visual guide on page 19 of the manual, and a video tutorial on the Mira-skin website. They explain how to glide the Active Boost wand over your face. The arrows on the photo show which way to glide the wand. Cover all your skin but avoid your eyes. Repeat 3 times on each facial area. Apply 1 to 2 mm of gel and cover all your skin with the treatment head. Start with your forehead: With gentle pressure apply the treatment head flat against your forehead between your eyebrows. Move slowly in circular motions, or smooth swipes across and down the left side of your forehead towards your temple, avoiding your eyes. Repeat 3 times. On your cheeks slowly glide the wand from your nose along your left cheekbone toward your temple with multiple swipes to cover all the skin, but avoid your eyes. Repeat 3 times. Glide down your left lower jaw to your chin. Repeat 3 times. Glide down your neck from your left jawline, avoid your throat / Adam’s apple. Repeat 3 times. Repeat on the other side of your face. 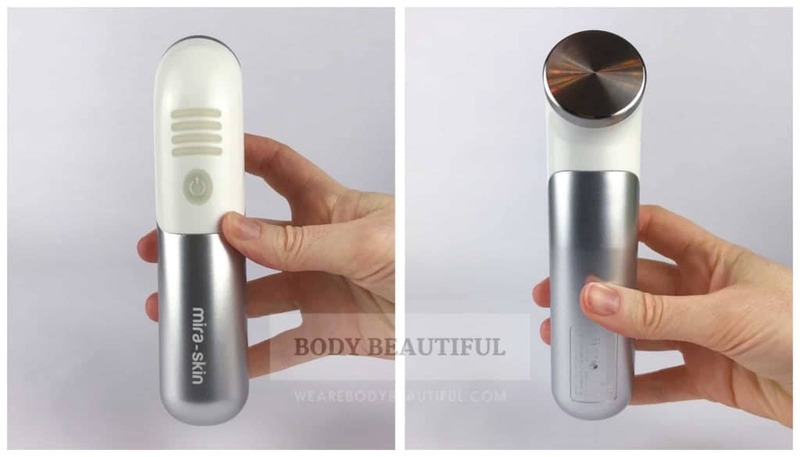 Left: directions to glide the ActiveBoost wand over your skin. Don’t treat your eye area, ears or your throat / dam’s apple as pictured above. Glide the wand, don’t stop in one place. And glide it in one direction only, not back and forward. Don’t use the Active Boost ultrasound more than ten minutes per treatment or more than 3 times a week. This can tire out your muscles and tissues and make your face look worse. 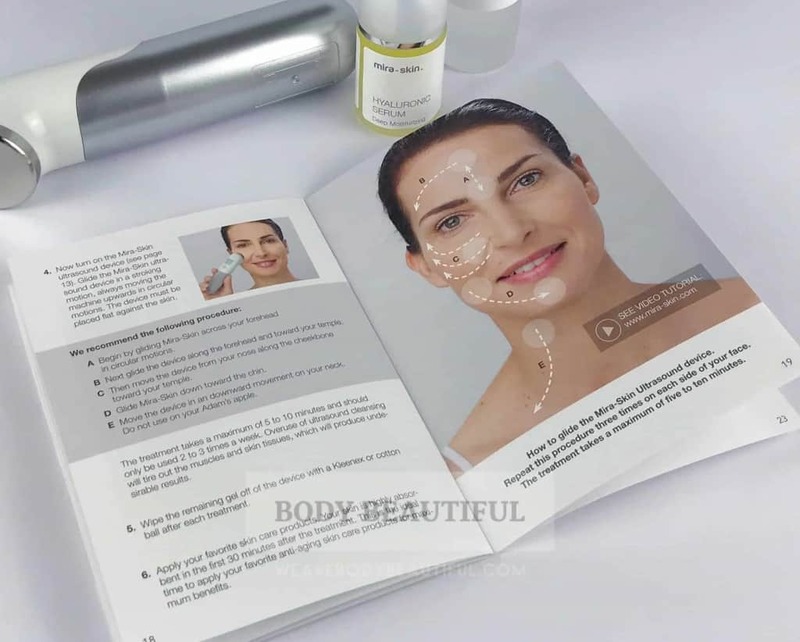 Now let’s look at the serum, ultrasound wand and gel in more detail. Mira-skin include a 15ml tester in the starter kit so you can try it out. I like that it’s got no nasties because it’s free from chemical preservatives, colouring, parabens, silicones and mineral oils. It’s vegan and it’s not tested on animals 👍. The packaging is simple but clearly labelled. Mira-skin use glass bottles they say, to prevent hazardous plastic leakage into the product and into your face. They’re also recyclable. However, the silver pumps are small, fiddly and slippery and ‘click’ down abruptly. So, some product can shoot out and miss the target. It’s the same with the conductivity gel. Mira-skin say to apply it every morning and / or evening. Apply it after cleansing but before your usual anti-aging skincare potions. It’s easy to make part of your skincare routine and is pleasant to use. It’s bright yellow with a slippery consistency. 2 pumps of it slips over my face and neck easily for even coverage before it sinks in. It’s neither greasy nor drying and it has a sweet, rose scent. It’s invisible once applied. I’ve used other premium skincare serums and it’s similar. It doesn’t feel immediately moisturising on your skin so follow it with a day or night moisturiser. Since using it our tester doesn’t feel any of the dryness they felt before. 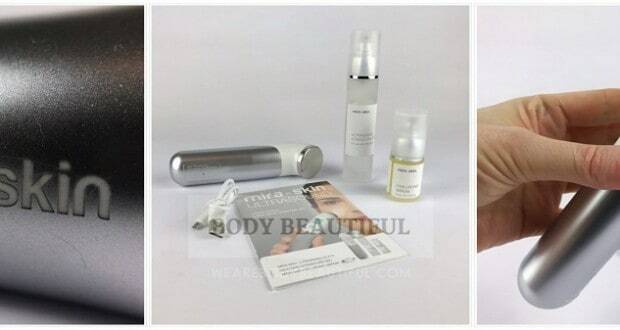 The starter kit has a trial size bottle of Hyaluronic Serum (15ml). You get around 20 applications from the 15ml jar. Using it twice daily that’s up to 2 weeks, or 4 weeks if using it just once a day. Personally, I don’t think 15ml is enough to test it properly. I’d like to get double that. However, I do think it’s good value and worth buying more. Keep reading to learn more. You must use ultrasound conductivity gel with the ultrasound ActiveBoost wand. It’s necessary to pass the ultrasound waves from the treatment head into your skin. Otherwise, they’ll have no effect. I admit, I don’t like the sound of applying gel to my face. However, it doesn’t smell, it’s a good consistency and it feels pleasantly cool on your skin. The gel dries slowly enough too (if applied in sections) and doesn’t leave a sticky residue. If you apply the gel in smaller sections, have a towel handy to wipe your hands after applying it. Or you can get in a bit of a slippery mess! 2 pumps from the 50ml bottle covers a section i.e. one side of my forehead, my cheek, jaw / chin etc. You don’t need to wash it off. Most of it is dry by the time you finish. But I still wipe around my face with a damp flannel to remove any wet bits. Then immediately apply your own moisturiser. The 50ml gel in the starter kit lasts 35 sessions or just over 2 months using it for 3 treatments per week. The cordless wand is very comfortable to hold and easy to grip. With just one button to power on and off, it’s super simple to operate too. The indicator lights illuminate bright green when it’s powered on. Long-press the power button to turn on / off the ActiveBoost wand. When it’s powered-on the indicators light up green and there’s a high and long beep. The newer design (as of 2018) has a 3.5cm diameter circular treatment head that’s curved away from the straight wand, and angled back at about 45 degrees. This means with the head flat against your face it’s comfortable to grip the wand and easy to glide across your skin. Note: the previous design was straight and held at a right angle to your skin. It feels quality, durable and well-made. Mira-skin highlight the treatment head is surgical steel. And this is a good thing because, compared to cheaper alternatives made from aluminium, there’s no chance of trace metal leakage into your skin. Yikes. The treatment head is surgical steel so it’s safe on your skin, hygienic, durable and easy to wipe clean. You can’t hear or feel anything from the wand when it’s on. But you can test it to see if it’s working. With it powered on hold the treatment head facing up and on it place a few drops of water with your finger. You’ll see the water droplets dance and vibrate around on top. The wand comes fully charged so there’s no waiting around. The battery life is excellent. Each charge lasts for several ultrasound sessions. When the indicators flash yellow, this means it needs charging. Always use the charging cable provided to charge it. The USB cable fits any mains plug adaptor though so there’s less to carry with you if you use it on the move. The charging cable fits into the rounded base. The indicators pulse yellow as it charges. The cable is short so find somewhere safe to sit it while it charges. The indicator lights slowly pulse yellow as it charges. When it’s fully charged, they flash green and you can disconnect the wand from the mains. Each full charge takes up to 8 hours. So, how does it feel to use the Mira-skin? At least once a week, use the serum and the ultrasound for a super-boosting facial treatment. Try picking an evening when you know you’ll be at home and you’ll have plenty of time. Like a Sunday or Monday evening. It’s quick, easy and calming. And although there are a few steps with gels and what-not, it’s very easy and intuitive. The gel feels pleasant and cooling, and as the ultrasound wand works, the temperature of the treatment head warms to the same as your skin. It has a safety control so the temperature never gets hotter. There’s no sensation from the ultrasound at all. You can’t feel any vibrations. It doesn’t take much concentration, save to remember how many glides you’ve done per area. And the gliding motion is slow and soothing. I find my mind empties as I follow the methodical routine. It’s a pleasant bit of pampering down-time to look forward to. Evenings work best. Make time before bed so there’s no rush. Treating before sleep is a helping hand for your skin’s natural overnight regeneration too. Try scheduling a relaxing evening each week. You can even pamper your significant other too. Use it 2 times a week if you feel the benefit, but never more than 3 times in a week. The Mira-skin is for regular use. Keep using it to maintain your results. Daily use of the serum keeps the pools of Hyaluronic Acid topped-up. And at least one serum and ultrasound session per week keeps the lower levels hydrated and your skin cell metabolism in high gear. Not only is it pleasurable to use but it’s just 10 minutes a week. It’s quite possibly the easiest and lowest effort anti-aging system there is. There’s a website for European (in English), German, United states and Swiss customers. It’s clear and informative, with helpful illustrations, videos and FAQs. Personally, I’d like more about phonophoresis because I like to understand the science behind it all. I hope this review helps there. 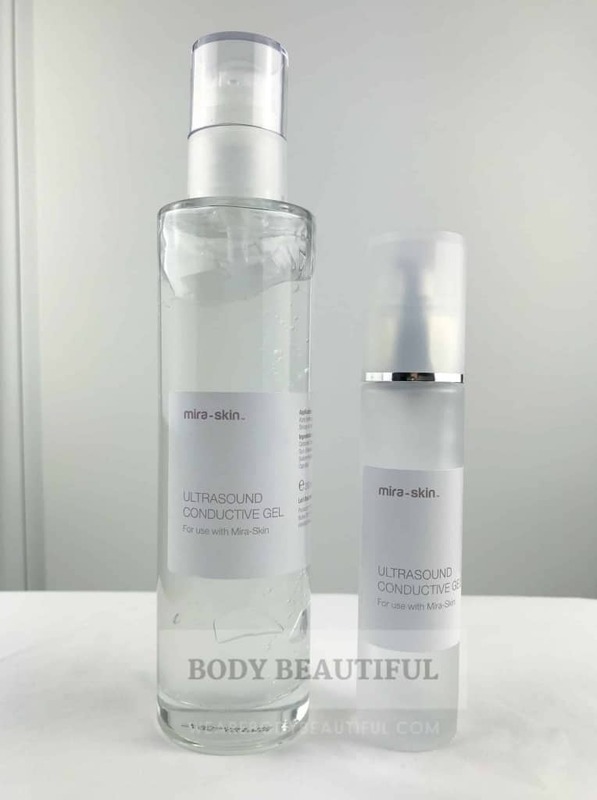 Mira-skin do a thorough job promoting the combined ultrasound boost and Mira-skin serum. However, it’s not very clear you can use your own anti-aging serum instead. And I think this is a big benefit because once you own it you can experiment with any anti-aging product and the ultrasound boost. You’ll need to call Switzerland for customer support, so to avoid European call rates you can email instead. Responses are prompt, friendly and helpful. You get a reassuring 2-year warranty on the ActiveBoost ultrasound wand. But, unfortunately there’s no money back guarantee. Mira-skin do a convincing job selling the benefits of the Hyaluronic serum combined with the ultrasound boost. And if you buy premium skincare the price is about right too. It’s available in 15ml (£49) and 50ml (£119) glass jars. But cheaper serums are available. So, is this the best choice? The Mira-skin Hyaluronic Serum is available in 15 ml and 50ml. The 50ml is much better value. It comes with a premium price tag but has impressive results. To start, it certainly feels premium. I love how easily it slips across your skin and then sinks so it’s invisible. Next, it’s a good all-rounder with a selection of antioxidants, skin brightening and rejuvenating actives. Plus, the super-plumping short-chain Hyaluronic Acid. Mira-skin say it’s got the most on the market, which is 8,000 times more Hyaluronic Acid than other 1% serums. And of course, it’s all formulated to get deep into your skin with the phonophoresis ultrasound boost. With impressive clinical proof. So, taking it at face value it’s super value and a superb choice. But what if you already have a favourite serum, or you don’t use a serum at all? How does it compare to others and should you choose it? The anti-aging serum is a vital step, so if you don’t use one now try the 15ml Mira-skin tester. It should last for around 2 weeks. You may see the benefits during this time. However, invest in the 50ml bottle for around 2 months of product. This is ample time to test it out. If you already have a favourite serum, or want to try a cheaper alternative, then check the ingredients to see what effects the ultrasound will boost for you. You can check the ingredients here. If it’s missing Hyaluronic Acid you may not get the plumping effect so consider if you need a separate Hyaluronic Acid serum too. Although the end results are noticeable, the changes during the journey are subtle. So, you may miss them without a comparison. Therefore, I strongly suggest you take some before and after photos and keep a simple diary of the changes in your skin. Test over 1 or 2 months. Repeat with different products (as many as you like) then you can compare them and choose what’s best for your skin. Is the Mira-skin conductive gel the best choice? You must use a water-based conductive gel for the ultrasound to work. It transfers the ultrasonic waves into your skin. The starter kit has the small 50ml gel (right). It feels pleasant and isn’t sticky. You can buy more with a 200ml gel bottle – But it’s expensive. You get a 50ml conductive gel in the starter kit. It lasts around 2 months if using it 3 times a week. You can then buy a Mira-skin 200ml replacement gel. So, what’s special about it? It’s a good consistency, it’s not sticky, it dries slowly and it’s got more Sodium Hyaluronate (aka Hyaluronic Acid) in it. It has moisturising and humectant ingredients too, so it’s going to help seal in goodies after ultrasound. It’s very expensive. At £69 for 200ml it’s £3.45 per 10 ml. Wow-ser. You can buy much cheaper alternatives. Amazon lists medical grade ultrasound conductivity gel for £2.50 for 250ml. That’s a massive price difference at just 10p per 10ml. Many are hypoallergenic and medical grade. They’ll conduct the ultrasound waves but may not contain the added moisturisers and humectants. However, you’ll apply your own moisturising skincare after ultrasound anyway so you don’t really need the added ingredients. I’d rather spend my cash on the Hyaluronic serum. It’s a bit much to fork-out so much for the gel too. Our tester has plenty of gel left from a 200ml refill so we’ve not yet tested an alternative. Next, a round-up of the pros and cons to help you decide. Just 10 mins per week! The Mira-skin gets a big smiley-grin thumbs-up. It’s a fantastic choice if you love and use good quality anti-aging skincare products. That’s because it boosts their effects and you get more from the money you’ve invested in them. The Mira-skin boosts the effects of the skincare you’ve already invested in. you can experiment with the results. It’s very easy to use, there’s no pain and it’s soothing and relaxing. And at just 10 minutes a session, it’s easy to make time for it. In fact, it becomes a calming weekly ritual and a bit of pampering me-time. Use it just once a week to see results after 1 or 2 months. You need to keep going but that’s easy because it’s the least effort anti-aging device there is. The Mira-skin serum works perfectly with the ultrasound boost and the mask is a mega-hydrating facial treat. The Hyaluronic serum is excellent and gives super plumping effects. Try the mask just once and you’ll be hooked too. It’s for you if you’ve perfected your skincare routine but want it to work even harder. It’s for all skincare junkies. It’s for your mum, your sister, your gran. It’s your new best friend. Efficacy of cream-based novel formulations of hyaluronic acid of different molecular weights in anti-wrinkle treatment.